Nicholas Pappone, lauded as a “first rate” violinist by Maestro Lorin Maazel, makes a diverse career as a soloist, chamber musician, and orchestral musician and teacher in New York City. Highlights of Nicholas’ 2016-2017 concert season include appearances at the Rutgers University Mallery Room Concert Series, Islip Arts Council, NY, the Church of the Holy Trinity at Rittenhouse Square, Philadelphia, and as the featured artist of Chamber Music at the Evergreens in New Jersey. Nicholas has performed with members of the Chamber Music Society of Lincoln Center, the Emerson String Quartet, Vienna Piano Trio, and the Zukerman Chamber Players. This includes collaborations with violists Paul Neubauer, Paul Coletti, Jethro Marks, and the cellist Paul Watkins. 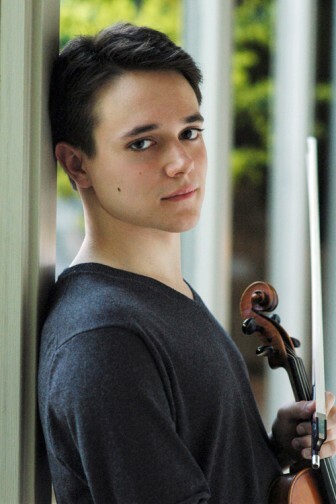 Nicholas is Principal Second Violin of the Huntsville Symphony Orchestra in Alabama and Assistant Concertmaster of the Chamber Orchestra of New York. Past solo recital and chamber performances in New York include the WMP Concert Hall’s Strad for Lunch, Cathedral of St. John the Divine, the Bohemian National Hall, as well as the National Arts Centre in Ottawa, and Heliconian Hall in Toronto, Canada. He is also the founder of Delius Music Academy, a non-profit that provides music education to New York City schools. Nicholas Pappone is a native of Los Angeles and is a graduate of Manhattan School of Music where he studied with Patinka Kopec. Nicholas began the study of violin at the age of ten. Playing the role of a prodigy violinist in an independent film inspired his interest in the instrument. Nicholas’s career as a child actor began at the age of six. He spent three years on the soap opera, The Young and the Restless, made numerous guest appearances on existing television series, and starred in several television series pilots. He left his acting career at the age of thirteen to focus entirely on his violin study. Solo competition wins include the Marina del Rey-Westchester Symphony Competition, the Palisades Symphony’s Young Artist Award, the Pearl Christlieb Award in the Valley Cultural Center Competition, and the Redlands Bowl Young Artists Competition. He has also been awarded scholarships by the Leni Fe Bland Foundation, the Westside Committee of the Los Angeles Philharmonic, and the Southern California Conservatory of Music. In the summer, Nicholas has continued his studies at numerous music festivals including Pinchas Zukerman’s Young Artist’s Programme in Ottawa, Canada, Norfolk Chamber Music Festival (Yale University Music School, CT), Toronto Summer Music Festival, Domaine Forget Chamber Festival (Quebec), Heifetz International Music Institute, International Music Academy in Pilsen (Czech Republic), International Academy of Music in Italy, and the Encore School for Strings.